The cobra effect occurs when an attempted solution to a problem actually makes the problem worse. This is an instance of unintended consequences. The term is used to illustrate the causes of incorrect stimulation in economy and politics. There is also a 2001 book with the same title by German economist Horst Siebert. A similar incident occurred in Hanoi, Vietnam, under French colonial rule. The colonial regime created a bounty program that paid a reward for each rat killed. To obtain the bounty, people would provide the severed rat tail. Colonial officials, however, began noticing rats in Hanoi with no tails. The Vietnamese rat catchers would capture rats, lop off their tails, and then release them back into the sewers so that they could procreate and produce more rats, thereby increasing the rat catchers' revenue. 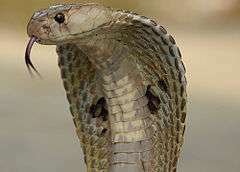 Historian Michael Vann argues that the cobra example from British India cannot be proven, but that the rats in Vietnam case can be proven, so the term could be changed to the "rat effect". ↑ Brickman, Leslie H. (2002-11-01). "Preparing the 21st Century Church": 326. ISBN 978-1-59160-167-8. 1 2 3 Dubner, Stephen J. (11 October 2012). "The Cobra Effect: A New Freakonomics Radio Podcast". Freakonomics, LLC. Retrieved 24 February 2015. ↑ Schwarz, Christian A. (1996). NCD Implementation Guide. Carol Stream Church Smart Resources. p. 126. Cited in Brickman, p. 326. ↑ Vann, Michael G. (2003). "Of Rats, Rice, and Race: The Great Hanoi Rat Massacre, an Episode in French Colonial History". French Colonial History. 4: 191–203. doi:10.1353/fch.2003.0027.